The American black bear is widely distributed across the United States and Canada. Twenty-eight states and all Canadian provinces have hunting seasons for black bears, with Maine having perhaps the largest bear population of the Lower 48. Typically found in forested regions, this species is adaptable and often found near civilization. Which area for black bear hunting to choose depends on whether your preferred hunting method (baiting, over hounds, etc.) is legal, and whether you want a classic black skin or a different color phase skin, e.g. brown, chocolate, cinnamon, red, or blonde. Color-phase bears are especially common in the northwestern United States. A rare bluish-gray color phase in Alaska is known as the Glacier bear, and the all-white Kermode bear occurs on several islands in coastal British Columbia. For the effort that is involved in preparation of a successful black bear hunt, including preparing bait sites, training hounds, etc., black bear hunts are relative bargains. They start at about $1,500 and seldom reach over $5,000. 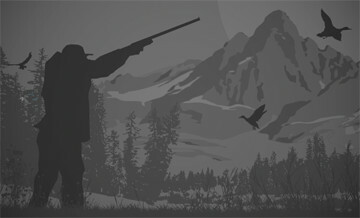 The most expensive propositions you see on BookYourHunt.com are usually fly-in or boat-based hunts in Alaska, which often come as package trips with a number of other species included in the price. Baiting is by far the most popular way of hunting black bears. By studying tracks and marks, and checking trail camera images, the outfitter can have a pretty good idea what degree of success their hunters can expect. However, baiting is not as easy as it seems. Whether you’re planning a DIY hunt or hiring an outfitter, you’ll find our blog story on bear baiting useful. When to hunt Black Bear? The big question for a bear hunter is whether to choose to hunt in the spring or the fall season. The spring season typically starts after the bruins get out of their dens in April, and can continue through June. Most hunters prefer the spring season because it offers a chance to hunt when most other hunting seasons are closed. Success rates are also often higher during the spring. The early part of the spring season works better for hunting over bait, as the bears make up for the winter fast. Late May to June is better for spot-and-stalk hunting: shorter nights mean bears move in the daylight more, and big males are bolder and more active because it’s rut time and they’re looking for sows. The fall season usually starts in September and goes on until the bears den in November. The closer to denning time, the better the skin and the fatter the flesh. Black bears are hunted by a wide variety of methods, depending on the terrain of the region and the regulations of the state or province. In some states and provinces, bears are hunted over bait with the hunter in a tree stand or blind. Some states allow bear hunting with dogs, and in other regions, drives are a traditional and successful method. In western regions, hunts are typically spot-and-stalk, and calling can also be effective. American black bears are typically the smallest of all types of bears, but in areas where food is abundant, a bear may exceed 600 pounds. They are usually less aggressive than grizzlies, but still account for quite a few maulings and even deaths each year. A certain degree of hunting pressure is necessary not only to keep the bear population in check, but also to keep them associating humans with danger, which acts as conflict prevention. Black bear meat (when it’s not infected with trichinosis) is a delicacy, and its hide, especially in an unusual color phase, makes a beautiful rug. A black bear’s sense of smell is excellent. Although its eyesight and hearing are average. they are very intelligent. Harvesting a black bear is quite a challenge, which is perhaps one of the greatest attractions of the hunt. Last Minute Cancellation - $2250.00 each with 2 or more hunters Our spring bear hunts take place from the last week of April to the first week of June in Northern Alberta. We accommodate both the rifle hunter and the bow hunter, each having an excellent opportunity to harvest a trophy black bear, or two! We have a 2 bear limit and we are regularly harvesting at 100% opportunity on the first bear and 80% on the second. We also have many color phased bears in our area, ranging from blonde, cinnamon, brown to black. Bears average 5-6 ft with 7 plus feet being possible. We primarily hunt using spot and stalk and average seeing 25 - 35 different bears per week of hunting. This is a great hunt to come and have a relaxed atmosphere while enjoying the outdoors in the spring. All bear hunts include wolf at no extra charge. In New Mexico we hunt the black bear species. They vary in color from jet-black to blond, with cinnamon and brown phases also being quite common. Most of our bear hunting is done from horseback behind hard-driving hounds. We also hunt from the truck with strike dogs on top of the box. Stand hunting can also be productive in the right situation, and is sometimes selected for hunters who are not up to the rigors of hound hunting. The area we hunt in New Mexico is well known for producing large bears. We have taken many bears with skulls measuring more than 20 inches. We have consistently produced 80 percent success rates on these hunts. Bear hunts can be combined with a variety of other species including lion, antelope, elk and deer. Licenses are purchased over the counter. We operate on both public and private lands and service southern Utah, including Plateau Boulder, Mt. Dutton, Zion, and Paunsaugunt just to name a few. We are happy to provide service to you for the Archery, muzzleloader and rifle hunts. Our goal is that our clients complete their hunt with a memory that will last a lifetime and a trophy that they can't wait to share. Our hunts, whether limited entry or general season, are conditioned to be successful for each individual. On a hunt with us , you will be accompanied by one of our premium guides and a spotter. Additional spotters are available upon request for an additional fee. Meals and Lodging for all hunts available for an additional $200 a day. $100 a day per additional guests on all hunts. As a client you are responsible for your own personal items such as appropriate clothing, optics and firearms. We will provide transportation while in the hunting unit or per prior arrangements made. You will be responsible for transportation to and from your hunting unit. Advanced accommodations for lodging and food can be made at an additional cost. We maintain a knowledge of the hunting units, boundaries and surrounding areas of your unit. Information regarding your unit can be provided in advance at your request. Black bear limited entry hunts dates, Aug 19- Sep 25 and Oct 28- Nov 16.